This video grab taken from footage broadcast by the U.K. Parliamentary Recording Unit (PRU), shows British Prime Minister David Cameron giving a statement in Parliament in London on June 27, 2016 following the EU referendum. Britain’s crisis deepened Monday as British and EU officials scrambled to deal with the shock of British voters’ decision to leave the European Union, and ease both anger and the uncertainty that has plunged the country into what some describe as its worst disarray since World War II. U.S. Secretary of State John Kerry stopped in London Monday and reaffirmed what he said is an unbreakable bond between the United States and Britain. 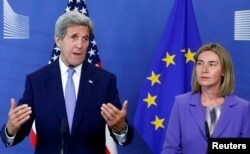 U.S. Secretary of State John Kerry and European Union foreign policy chief Federica Mogherini (R) address a joint news conference after their meeting at the EU Commission headquarters in Brussels, Belgium, June 27, 2016. British officials spent Monday working to contain the aftermath of the vote that sent markets and the British pound tumbling for another day. In his first remarks to parliament since the vote, Prime Minister David Cameron said the British economy is strong enough to deal with the turbulence. “It is clear that markets are volatile. There are some companies considering their investments and we know this is going to be far from plain sailing,” he said. Earlier, in Brussels, Kerry appealed for calm amid the anxiety that British voters’ decision has caused in Europe, and in global markets around the world. He also cautioned EU members against punishing Britain for its decision. “It’s absolutely essential that we stay focused on how, in this transitional period, nobody loses their head, nobody goes off half-cocked, people don't start ginning up scatterbrained or revengeful premises,” Kerry said. 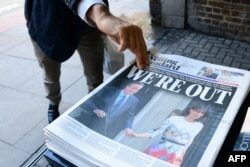 A man takes a copy of the London Evening Standard with the front page reporting the resignation of British Prime Minister David Cameron and the vote to leave the EU in a referendum on June 24, 2016. On the continent, calls by EU founding members for Britain to get out quickly were tempered by German Chancellor Angela Merkel, who has called for a civil, organized exit. After meeting with leaders of Italy and France, Merkel said there will be no informal talks on extricating Britain from the EU until the British government formally initiates the process. France and other EU founding members want Britain out quickly in order to end the uncertainty that is driving market volatility and hurting economies around the world. To trigger the exit process and begin negotiations for a departure, the British government must invoke Article 50 of the EU treaty. Who will do that and when remained a question Monday as Britain struggled through its most severe political crisis in memory. Following Cameron’s planned resignation, it remains unclear who will take over and begin the exit process. Cameron’s Conservative party on Monday said it now plans to choose a new leader to replace the prime minister by September 2. Earlier, Cameron said his replacement would be chosen in October. The decision came as calls grew for the governing party to move more quickly to begin the transition and shorten the period of uncertainty. In the Labour Party, calls grew Monday for the resignation of party leader Jeremy Corbyn after 12 members of his shadow Cabinet resigned. "There continues to be a sort of civil war inside the government party, the Conservatives, while at the same time Labour Party is in even worse condition and presents no realistic possibility of being an alternative government. So that means the whole political system is really relying on the continuity provided by history," said Tony Travers, a politics professor at the London School of Economics. “This is a very unusual time for the U.K. and nobody should pretend otherwise,” he told VOA. 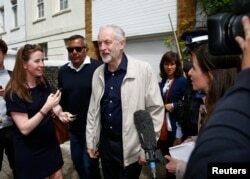 Britain's opposition Labour Party leader Jeremy Corbyn (C) leaves his home in London, June 26, 2016. Tensions were worsened by reports of hateful behavior against immigrants. London Metropolitan Police said they were investigating "allegedly racially motivated" attacks on immigrants, including the scribbling of graffiti on the main Polish cultural center in West London’s Hammersmith area. Some residents reported finding cards in their mailboxes that read "No More Polish Vermin." Police drew no conclusions of a link between the incidents and the Brexit vote at this stage. In his remarks to parliament Monday, Cameron said EU citizens living and working in Britain will have to wait until the negotiation process with the EU begins, but noted that “Leave” proponents during the campaign promised that their rights would be respected.